Age Limit: Candidates age should be 18 to 23 years as on 01-08-2018. Education Qualification: Candidates should have passed senior secondary (10+2) from a recognized board or university. Selection Process: Candidates should be selected on the basis of Written Exam(CBE), PET, PST & Medical Examination. Application Fee: Candidates are require to pay 100/- through SBI Challan/SBI Netbanking or by using Credit or Debit Card. No Fee for SC, ST, PwD, Ex-Serviceman or Women Candidates of all categories. How To Apply: Interested & Eligible Candidates can apply online through www.ssconline.nic.in from 21-07-2018 (Extended 17/08/2018) to 20-08-2018(Extended 30/09/2018) by 05:00 pm. 2. 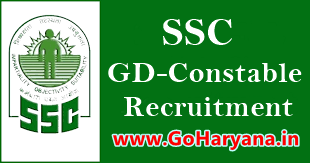 See the Section GD-Constable and Click on "Click Here to Apply". 3. In left side click on New Registration and fill up details carefully. 4. After Registration View/Edit Registration and Upload Photo & signature & Submit Form. 5. After completing step 3 & 4. Apply in Apply Part. Note:- Interested Candidates can read the full notification before apply online. Notification link given above.